I must admit, my knowledge of Arc’teryx was very thin; I recognised the logo but did not know how to pronounce the name properly . . . oh how much of a fool do I feel now! But my problem had been remedied, for this winter I was lucky enough to be properly introduced to the brand. The brand is named after ‘Archaeopteryx Lithographica’, which represents a unique period in evolution, it was the first reptile to develop feathers for flight; quite an amazing moment in time and quite a name to live up to. 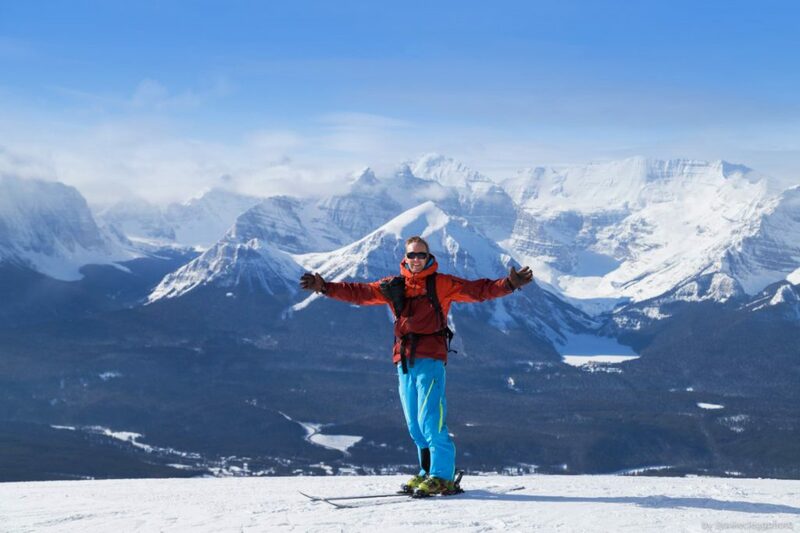 Based out of North Vancouver, one of the best positions for direct access to skiing, climbing and all of the outdoor activities that one could want as well as being a hub of activity and design. Founded in 1989 by local climbers, the company still has the same vibe with a handful of adventurers who also happen to be designers, pattern cutters, product developers and material specialists who design and test the products to fit their own experiences in the local mountains. The designs appear to be minimalist with function and activity based at the core of every design; with the products being tested on athletes and people who work in the field from day to day. 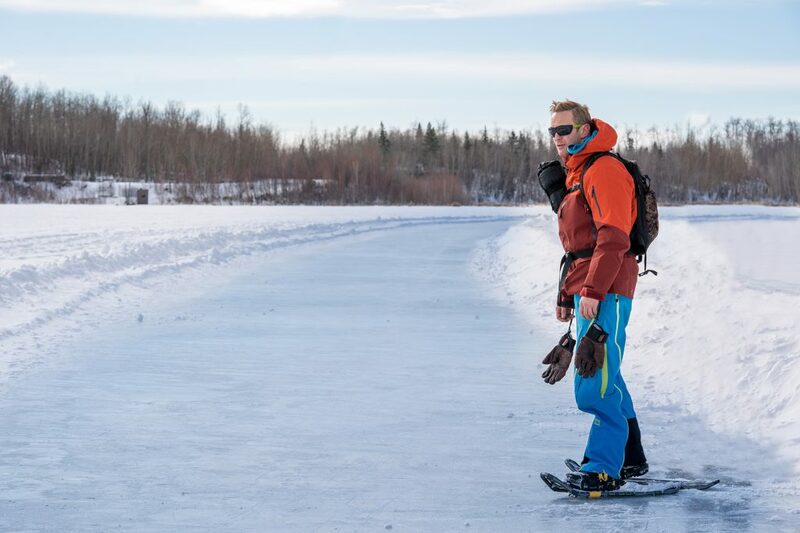 For a lot of this winter I have been putting the Arc’teryx Men’s Rush Jacket to the test through my winter activities and pursuits. 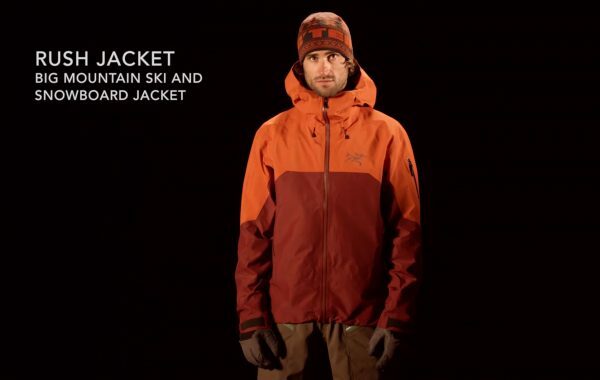 The Rush jacket has been designed specifically for skiing and snowboarding with freeride being the main theme, the jacket has been built as an outer shell to be worn with internal insulated layers to protect from the elements, but allow for complete movement without hindering. Made from the famous waterproof fabric that is Gore-tex®, Arc’teryx have worked with this fabric since 1995 because of the amazing performance and especially its durability. The specific fabric is N80p-X GORE-TEX® Pro 3L, quite a mouthful but it means that the fabric is waterproof, windproof and especially important – breathable so you won’t sweat, get damp and freeze on a mountain side. This particular fabric has also been designed to be as tough or even tougher than the wearer; and at 560gms and able to fold up pretty small, it is perfect for ski-touring or split boarding. Arc’teryx do not just rely on laboratory tests and research papers, they rigorously test every product on the mountain. The Rush jacket has been designed with ‘e3D patterning’ for enhanced range-of-motion, I have to say as soon as I donned the jacket, it seemed to have plenty of room but without swamping me and feeling oversized, whether I had several insulated layers or very few thin ones beneath. The Jacket has been well tailored with sleeves set forward, ‘articulated elbows’ and ‘No-lift gusseted underarms’ which means that one can move one’s arms about without the jacket lifting up and baring your kidneys to the elements or pulling tight across the back. This jacket just feels like a second skin, without getting in the way or restricting all the movements one might be performing, it seemed to sit well on my frame and dare I say it had a slightly heroic looking shape. This ergonomic fit is key to Arc’teryx designs, and is not obvious initially until out in the field and moving about, in a way the tailoring is the unsung hero in the design process, but possibly the most important design feature. 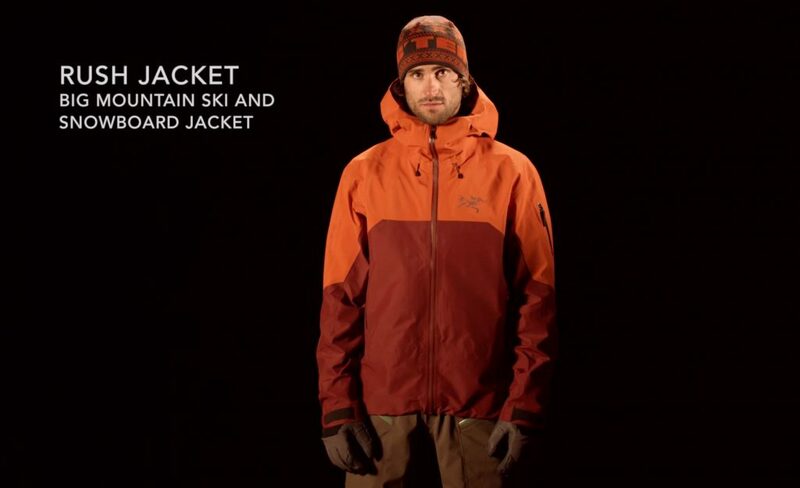 Other features that make the jacket so valuable are such features as the helmet compatible hood, brushed micro suede chin guard to prevent my stubble catching, pit zipper vents to stabilise my temperature with increased activity, powder skirt to keep snow out of my pants, and lastly the Recco® reflector for rapid rescue. The selection of internal and external pockets were great, but one might want to test that the two external pockets are still accessible when donning a rucksack with wide shoulder straps. 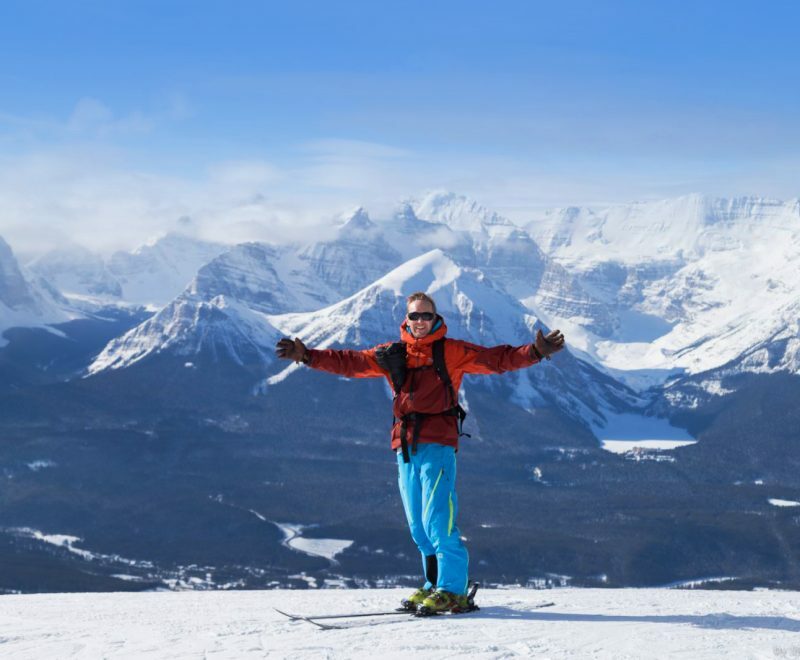 I really liked the Arc’teryx Men’s Rush jacket, it performed really well in all of the conditions that I threw at it from the Alps to the Rockies, from skiing to ski touring, from snow-shoeing to even fat biking in the snow! The fit is what impressed me the most, it seemed to flow with me and keep up with whatever I was doing in the snow never restricting me or holding me back. The jacket also looked . . . to be honest pretty awesome, I felt like an action hero which lets face it if you are feeling it then you are halfway there. I look forward to the many more adventures that I will be sharing with this jacket and it is good to know that the jacket is backed up by an Arc’teryx guarantee for the practical lifetime of the jacket. I mentioned that the brand is named after the ‘Archaeopteryx Lithographica’, an iconic moment in evolution; well I think Arc’teryx can sit safely knowing that they are at the forefront of the evolution of outdoor clothing. For more information on Arc’teryx see online.